On Feb. 20, 2010, Nassau Veterans Memorial Coliseum, New York, hosted Pop-Con Festival Experience, an all-day music event for tweens & teens with multiple stages, various vendors and games with the amenities of a family-friendly convention environment. Featuring over half-a-dozen musical artists, skateboarders and young pop icons, Pop-Con aims to be the pop event with the stars the kids want to see similar to what Comic-Con has become for fans of all things Comics and Film. Pop-Con 101 is a 2-hour seminar providing practical advice and insight on how to develop a career in the world of pop music, which featured information from and Q&A panel discussions by several successful record execs, managers, agents, producers and attorneys in the music business (see list below). Pop-Con 101 attendees had the opportunity to submit audition videotapes which are now being reviewed by a panel of record company talent scouts in the weeks following the Pop-Con. 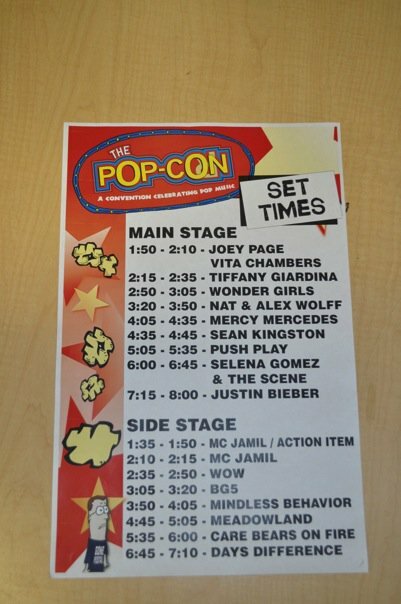 Featured performers on the Pop-Con included pop sensations Justin Bieber (currently boasting two singles on Top 40 radio), Disney Channel’s “Wizards of Waverly Place” Star, Selena Gomez and her band the Scene, and many other special rising young stars. Pop-Con is more than a concert, with gaming stations, product sampling and vendors, including a “Culture Mall” that will featured big name independent fashion merchandise companies such as Glamour Kills and BeePosh. In addition, and most importantly to HMB’s readership, the event hosted programmed lectures, seminars and other opportunities for young, aspiring artists, actors and actresses looking to get advice from top industry professionals and stars of sport and screen. Chris Kirkpatrick is credited as the one who put together and started *NSYNC,whose albums*NSYNCand No Strings Attached each sold over 10 million copies earning them the prestigious RIAA Diamond Award for both albums. He along with his four other band members achieved a music industry coup by selling over 56 million records and still hold the records for most records sold in a single day and first week. No Strings Attached sold a staggering 1.1 million albums on the first day of its release and went on to sell a 2.4 million in that first week. Chris has appeared on countless TV shows, magazine covers and won numerous music awards and performed the Super Bowl Halftime Show. Craig Bruck is a music agent at International Creative Management (ICM), where he oversees touring and concerts for a wide range of pop, hip hop and rock and roll artists. Craig, an avid rock and roll fan and drummer in the band Tiajuana Caravan, began his career as an agent at Evolution Talent Agency where he played an instrumental role in developing some of the largest touring artists in music history including the Backstreet Boys, Britney Spears, and ‘NSYNC, as well as pop acts such as Hilary Duff, O-Town, LFO, BBMak, Aaron Carter and Lil Romeo at the peak of their careers. In 2004, Craig launched his own talent agency, Bruck Talent, where he helped build the careers of The Jonas Brothers and Teddy Geiger, before joining ICM in 2006. Currently, Craig is based in ICM’s New York office, which boasts a music roster including Beyonce, Chris Brown, Gym Class Heroes, Neil Young and the Strokes, and personally oversees touring for Nick Lachey, Push Play, Parachute, Kat Deluna, Bobby Long, Brendan James, Chase Coy, Crime In Stereo, and Company of Thieves. He is constantly seeking out new talent. Vita, the 15-year-old singer from Barbados, is living proof, in her personal history and in her music, that the future of pop is going to unfold in a world without boundaries and limitations. Inspired, like so many young talents, by her parents’ record collection, Vita, born Vita Chambers in Canada, was raised in Barbados on both her dad’s rock and roll music and her mom’s R&B, and became an avid YouTube watcher, with the result that Andrea Bocelli, Robert Plant, Freddie Mercury, Tina Turner, Imogen Heap, Coldplay, and Pink are as much her musical and vocal heroes as Michael Jackson, Aretha Franklin, and Whitney Houston. She now laughs off a school choir solo at age 10 that she recalls as a disaster, but it was after singing lead for a band at a school talent show just last year, choosing her friends’ pop-rock favorites like “So What,” “Bleeding Love” and “Hot ‘N’ Cold,” that she resolved to pursue pop music as her profession. With that voice, Vita has now scored a worldwide recording deal with SRP/Universal Motown through Universal Motown President Sylvia Rhone, who signed such landmark female acts as En Vogue and Brandy to their first major-label contracts. Steve Greenberg is Founder and CEO of S-Curve Records, based in New York, which he founded in 2000 and re-launched in 2007 after a two- year hiatus. S-Curve has had great success with a wide range of projects, including releases from such artists as Joss Stone, We The Kings and Fountains of Wayne . Steve was a 2005 Grammy nominee in the ‘Best Pop Vocal Album’ category as co-producer of Stone’s “Mind, Body and Soul” album. S-Curve’s very first release, “Who Let The Dogs Out” by Baha Men, sold over four million albums worldwide and earned Steve a 2001 Grammy Award in the ‘”Best Dance Recording” category as producer. Rolling Stone’s 2008 Hot List Producer of the Year, he has produced and composed songs in a wide range of genres of popular music. His eleven U.S. Top 40 hits include RIAA Platinum-certified chart-toppers for the likes of Boys Like Girls (“Love Drunk and “The Great Escape”), Metro Station (“Shake It”), and Gym Class Heroes (“Cupid’s Chokehold”). He has also written and produced for GRAMMY-winning artists Carole King, Train, and Arrested Development, as well as recently Platinum-certified pop stars Katy Perry and David Cook. Other notable collaborations include Jonas Brothers, Miranda Cosgrove and Cobra Starship. He is currently producing the much anticipated Nikki Jean project for Columbia Records. *Next year, will advise you of this event BEFORE it takes place so some of you can actually attend and benefit from this unique opportunity!